Quite possibly, the best basketball game ever made. I don’t typically begin a review by discussing my personal biases, but in this case I think it is important to frame the man-crush I have for NBA2K11. 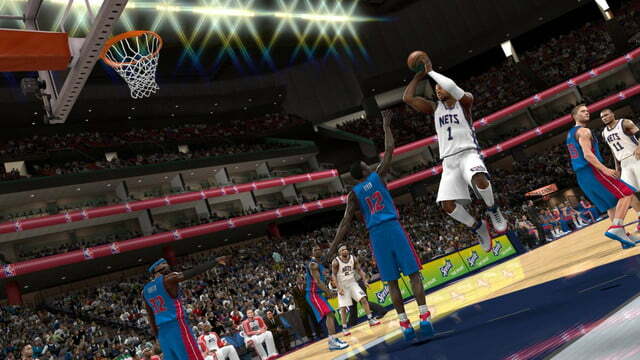 I have never been a fan of basketball video games, but I really, really wanted to be. I love basketball. I went to the University of Kansas, where basketball is a religion, and figures like James Naismith are legends that have streets named after them. I have played several basketball games over the years, both college and pro, and on all the systems that I have owned throughout the years — of which there have been many — I enjoyed many basketball games, but generally played them and forgot about them. So please understand that I am not exaggerating when I say that NBA2K11 is without question, the best basketball video game I have ever played. The game isn’t without a few minor flaws, but 2K Sports put a lot of care and thought into this game. Everything in it exists for a reason, and while in most yearly franchises you simply get a newer version of the same thing, NBA2K11 is a significant improvement over its predecessor. It isn’t perfect, but it won me over. And then of course there is Michael Jordan. Adding Michael Jordan to NBA2K11 is much more than a gimmick; it is a complete section of the game that could stand on its own. It is too short to justify a full price tag, but 2K could have simply released the Jordan Challenges as a download, and it would be a hit. But since it is just one part of an incredibly deep game, it makes NBA2K11 the best value in terms of basketball video games on the market, and arguably in terms of sports games on the market, too. When you start the game for the first time, you will find yourself standing in the tunnel behind Jordan. You then run out onto the court and begin your NBA2K11 experience by facing off against Magic Johnson and the ‘90-‘91 Lakers in the first game of the 1991 NBA Finals. Then the game begins. The Jordan Challenges comprise 10 moments from Jordan’s history, from his early days to his return from retirement. They ask you to play through the games and match Jordan’s impressive feats, such as dropping more than 63 on Larry Bird’s Celtics or better FG average against the Knicks after Jordan’s return from baseball, or outscoring Dominic Wilkins while holding him under 25 points. For those of us who grew up watching Jordan, it is a nostalgic tour through our childhoods, where Jordan was king, and the NBA was in a golden age where players like Magic and Isiah Thomas helped define the era. They were bigger than life- modern day heroes that belonged on cereal boxes. The stories being retold are the legends of our youth. Even if you hate basketball, it is hard to forget the iconic image of Jordan simply shrugging after making six three-pointers against the Trailblazers in the ’92 Finals- which as a Portland resident was tough to relive. 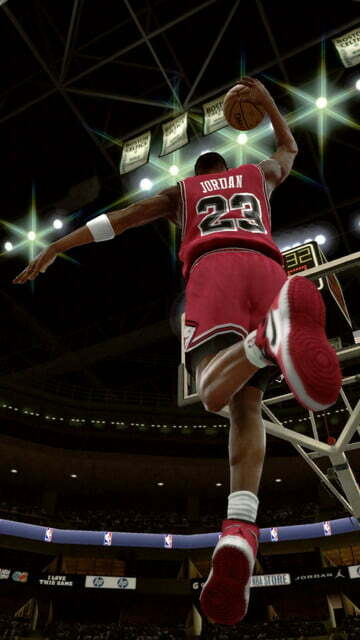 The Jordan Challenges let you relive those moments, and they do so in style. The challenges are not easy. In fact, they can be positively annoying at times, unless you are a veteran of NBA2K games, and even then they are hard. But completing them rewards you with the ability to start a career with a young Michael Jordan. He starts out as a top-rated rookie, but you will need to build him into the behemoth he is destined to be. Once you do, you can assign him to the team you want. While the inclusion of Jordan into the game makes it a story worthy of headlines, his role would be seen as little more than a gimmick designed to sell games if gameplay were just average. 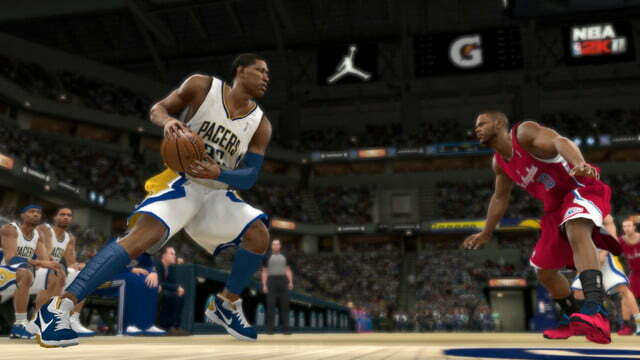 Thankfully, NBA2K11 nailed it. The controls have been tightened over previous games, making it surprisingly easy to switch strategies on the fly and set up plays with the push of a few buttons. The IsoMotion movements with the left stick have also been improved, which allows for better ball control and a more natural feel to the game. For example, while you are dribbling, you hold the left trigger and press the opposite direction for the ballhandler to switch hands. Add in a half circle and he will dribble behind the back. Time it right and you can burn defenders, back them down, or perform several other movements, all with the proper timing. The right stick, known as the ShotStick, also opens up dozens of possibilities. It takes some time to get used to it, but once you do, it makes it possible to pull off some incredible plays. You can even change the play while in the middle of another and create new moves. If you go up for a layup, but it looks like you are about to be blocked, the ShotStick will allow you to switch hands in mid air and try to get around the defenders’ arms. It takes practice, and during a game you will make more errors than great plays at first, but thankfully you can get by with the shoot button until you feel comfortable with the ShotStick. Plus, it gives you something to keep playing and practicing. You may pick up the way it works quickly, but it will take time to master it.